In late October we finished up raw coins for a bulk submission by VSS to PCGS. We now have all the images back from VSS and will be working them into the web site during February. So you may find pages with items that look a little out of place but this will be short lived as we fill in the blanks with coins. To us this seems like an unusual batch of coins since we purchase them based on interest and not grade. When we see a feature that looks to be unique and fills in some gap we try to grab it at a reasonable price. But that process produced some unusual results. Of the seventy-four coins that graded, half turned out to be AU grades with an unusual number of AU50 coins. Usually this is a difficult grade to hit much like the MS60. In our experience the graders try not to settle on either AU50 or MS60 and tend to go one higher or lower. But in this batch we had nine AU50 and three MS60 coins. All but five coins VAMed and they were lower grades with one AG03 and four G04. Everything above grade G04 VAMed or is off for further analysis. Right now we have five of the coins off for LVA to analyze as potential discoveries. However, as many of you know this is a busy time of the year and we do not expect the results until late February or early March. Mixed in with the group were several very nicely toned coins that will be good additions to our collection. This one really caught our eye because it is toned on both sides and has some really nice rainbow effects. This is an MS61 VAM 34A, and maybe our favorite from the batch. The VSS images are excellent as always. Filling in the blanks is also a great thing and we found our first VAM 43. This gives us 88% of the known VAMs for the 1881-O series. We believe that we have located several very early state of the VAM 1D Pummeled "Flaky" Eye. Although we want some additional confirmation from VSS, the coin has all the trade marks of the right VAM. If we are right then the deterioration of the area just above the eyelash is just beginning to cave in, and the "spider veins" across the eye and nose are also just beginning. Although we will wait on final confirmation from VSS and PCGS we think this is a bit of a coup in learning how the Flaky Eye evolved. For now it seems that the error did not just occur from damage, but that the die slowly deteriorated in some way. In July we found a similar proof-like coin without the usual deterioration and this coin can potentially be either proof like or deep mirror proof like. So the development of the error and the progression of the die state may be illustrated if we can just find enough of them. But for sure there are die states in addition to grade states to study if we can locate them. We had a brief discussion about how to get youngsters involved on the VAMworld message board last month. So I decided to test the water with an 1891-O VAM 1A featuring a Clashed E.
First, our grand children have never seen a Morgan Dollar, so this is all new. We asked five pretty easy questions. Below the bow on the reverse there is an "O." Between the Eagle's tail feathers and the top of the bow there is something there that isn't supposed to be there. Can you find another on on the coin somewhere that is the same size? How did it get on the back of the coin? It took about two weeks, but they solved it. Our 9 year old was first to find the "E" and where it came from. The concept of clashing is still a way off in the future, but it will come. We asked a few questions out on the VAMworld message board in January that hit at our planning for some new software. Like many of you, our needs are almost met by many of the programs readily available. But they never quite fit all the needs. Having once been in the software business we understand the challenges and dilemmas the various individuals and companies face who must earn a living. We are sympathetic to the challenges, but also frustrated at the lack of features and functions needed for two specialized categories of Morgan Dollar collectors. We were once lowball collectors and now have moved on to VAMing. These are so specialized that no developer would specifically aim software at them because it would not be profitable. On and off through the years we have purchased and tried at least seven programs, evaluated at least five more, and tried Excel spreadsheets and other alternatives. We just looked at so many options it has become tiresome. All of these have benefits but those who are doing this for profit have a dilemma. Each program needs to be generic enough to attract a wide audience, but that excludes specialized collections. Otherwise the software is not profitable and they disappears from the scene. We have all seen these come and go. Invariably they get off into international collecting to keep sales going and many sacrifice functionality for breadth of coverage. One of the best we tried has a strong database, but had to go international to attract sales. This "watered down" the effort so much that they could no longer pay attention to pricing, new coin additions, etc. They pride themselves on having ten of thousands of worldwide coin images, but can no longer do the basics. Enough on our philosophizing and on to what we are developing. We want a program with specific needs for VAM and lowball collectors, but with enough flexibility that Lowballers and VAMers can also maintain their other coins. ​ We have specifically stayed away from some of the things we see as pitfalls. The core functionality of the software works and is stable. We have actually been using it for a month with our own collection with no issues. However, there are a significant number of housecleaning and technical challenges to finish up. Hopefully we have enough high tech friends to conquer the remaining work (we think). We might have to spring for a bottle of wine or two, but a small price to pay. As things develop we will have more, but since this is not a profit making venture please be patient. As we get closer to the finished product we might look for a tester or two, but we are not there yet. Someone asked the question on VAMworld about New Year's resolutions and we responded that we want to continue our full court press on VAMs 21 and 29. So here are the details of these two elusive ladies. We discovered quite by accident that the discovery coin is listed on the SSDC site as an MS 64 ICG certified coin. So far as we can tell no one has come forward with another certified copy of VAM 21 since its discovery back in 1980 by Martin Field. We do not doubt the existence of the VAM 21, only that no one has documented a second one in 36 years. Since there is no photographic evidence of the discovery coin, through VAM 10 you can at least know part of what to search for when looking. 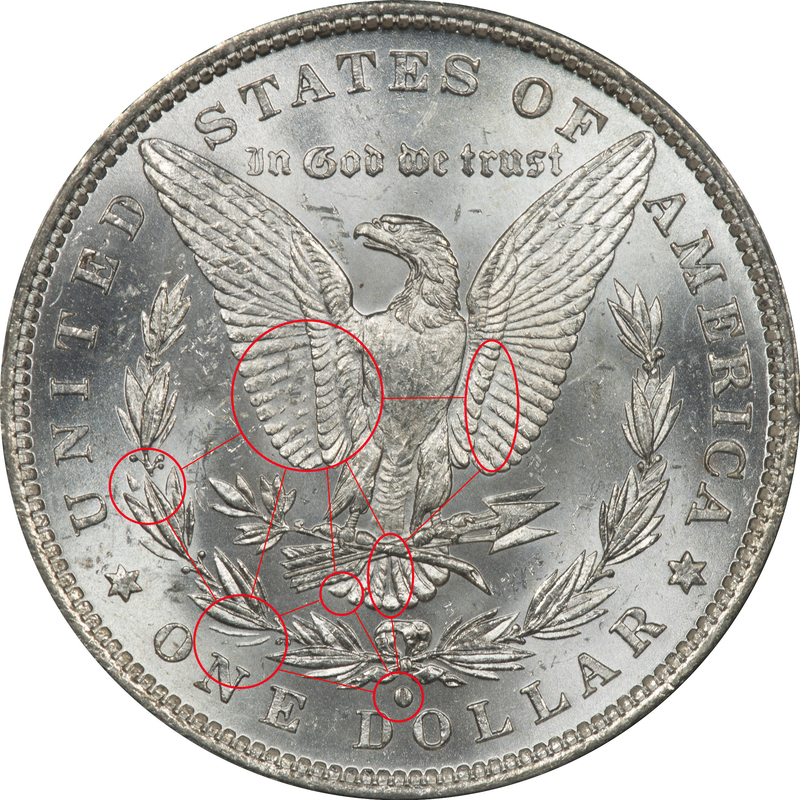 VAM 21 shares a reverse with VAM 10, yet the obverse lacks the date doubling or tripling of the VAM 10. 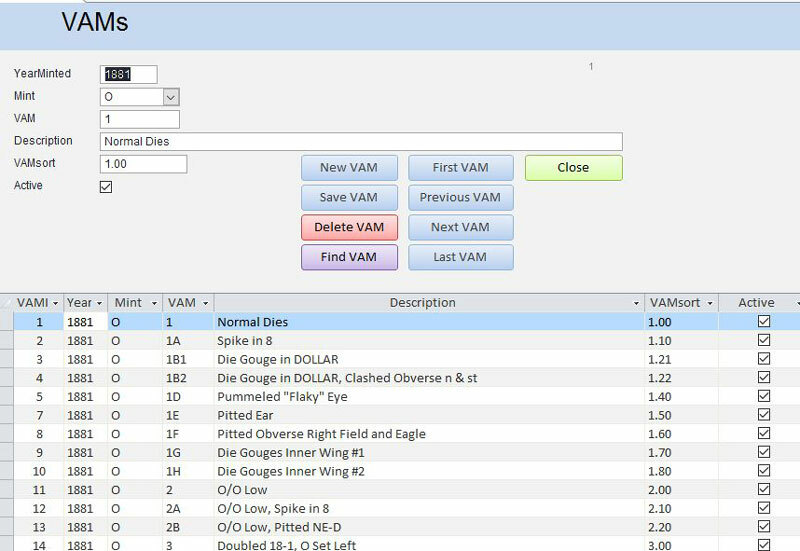 They are two different die parings where the VAM 21 has Die 1, and VAM 10 has Die 5. 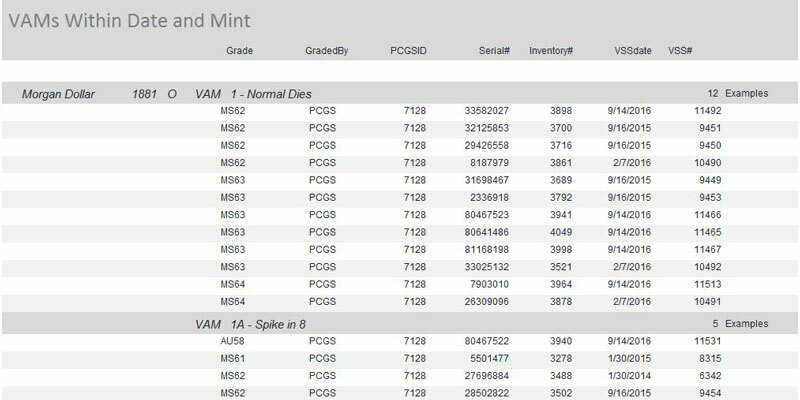 Adding to this hope is that on VAM 21 the missing die pairing is Die 1, not some obscure die that has only been seen once. So when looking for VAM 21 we know where to start. You go on a path through VAM 10 and work until you find that reverse paired with Die 1. In the picture above some of the visual clues to Reverse Die h are identified and we believe just a "brute force" attack on coins with Reverse Die h may produce a VAM 21 coin. If not then we are going to have a lot of VAM 10 coins to produce some study! But VAM 29 is a totally different challenge, and we are not sure it can be found, and here is why. VAM 29 was discovered by Herbe Zepke back in 1998, which does not seem so long ago, but it was 19 years back. Like the VAM 21 no one has come forward to document owning another one. We do not doubt the existence of the discovery coin, only that it cannot now be examined and no one seems to know where the coin resides. Further complicating VAM 29 is that there is no known photographic evidence of the discovery coin. Without either the coin or photographic evidence comparison to later discoveries cannot be made to know if VAM 29 was superseded by later VAM discoveries. Then there are die issues with VAM 29. The VAM has obverse Die 18, and reverse Die a. Now reverse Die a could be a clue to finding the coin if it were any other die. But Die a is shared by so many other VAMs that it becomes useless in identification. So we would then turn to the obverse die to find associations. But for VAM 29 the obverse die is Die 18, which seems to be shared with no other VAM. So we cannot go to the photographic evidence for shared dies to find a starting point for our search, nor can we do any comparison with later discoveries to determine if there was overlap with other VAM discoveries. Resolving this issue is not easy. It can be more difficult to "kill" a VAM than to make one for a number of good reasons. First, just because you cannot find one does not mean it doesn't exist, only that you may not have looked long and hard enough. Second, we know that a discovery coin did exist that was examined and identified with the unique die pairings to produce VAM 29. Quite by accident we stumbled on to a book that has the potential of unlocking many of the production questions about Morgan Dollars. As an addendum to Roger Burdette's From Mine to Mint this is a wonderful resource. One of our other collections is American Eagles and looking for something to read we happened upon John Mercanti's second edition book. For those who do not know Mercanti was the twelfth Chief Engraver of the US Mint and worked his way up from the ground level. His explanations and understanding come from hands on experience and not intellectual curiosity. We often have questions and discussions on VAMworld about production processes and the second chapter pretty much fills in all the blanks. Since Mercanti's career spanned the use of the Janvier lathe to modern digital production he was familiar with both. His discussion about preparing the working models for sculptors and engravers answers a lot of questions, and also helps understand the challenges. Assuming that the processes in the late 1800s were even more primitive the challenges for George Morgan would have been even more challenging. In our opinion this book is worth the price even if you only read the second chapter. 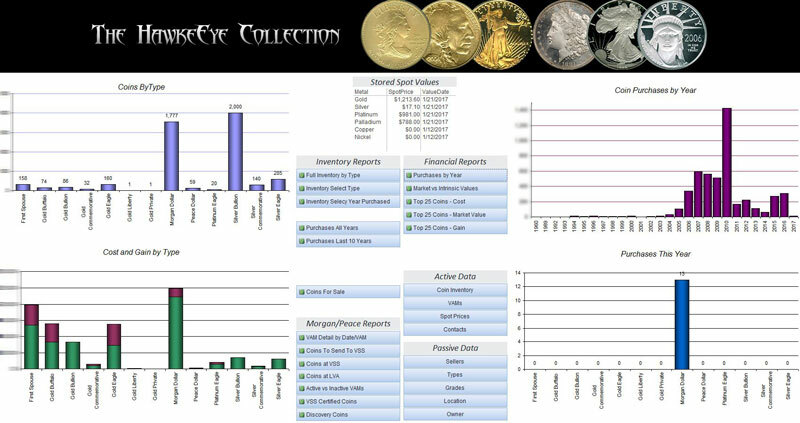 Check it out and you will understand coin production in much more detail.